This handmade ornament of Mary kneeling beside baby Jesus in a stable was made by Lety, who lives in a village near Trujillo, Honduras. 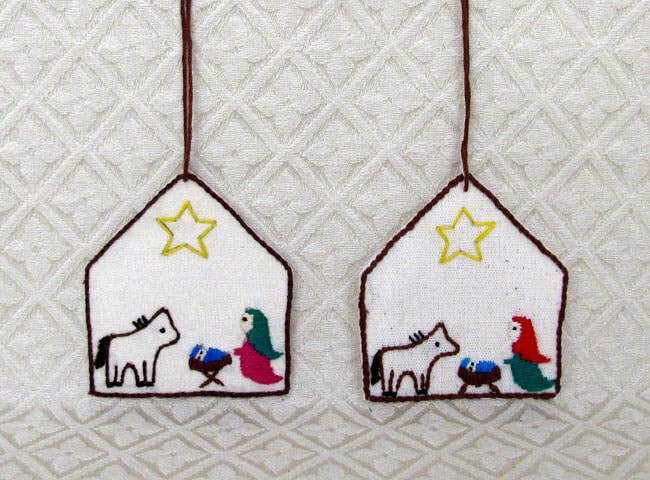 Lety uses embroidery floss to sew her designs onto a piece of cloth by hand. She mounts the finished cloth onto a piece of stiff fabric backing so that the ornament will hold its shape and not curl when displayed. The ornament measures 3 inches tall by 2.5 inches wide. Please note that each ornament has some color variation. Two ornaments are pictured to show variation.